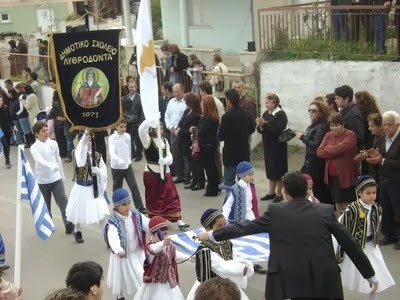 Saint Therapon of Lythrodontas came to Cyprus with the group of the three hundred refugees from Palestine during the persecutions carried out in the seventh century by Muslim Arabs. Having lived in the Palestinian desert, he learned the life of monasticism, asceticism, prayer, humility, vigils and abstinence. 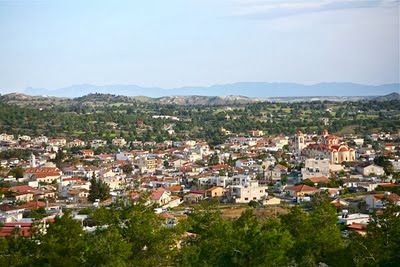 Upon arriving in Christian Cyprus, he started searching for a parallel place for ascetic exercise and found the right place, along with water close to it, near the village of Lythrodontas in the province of Nicosia. In that desolate site of Lythrodontas, Saint Therapon, after many spiritual struggles, was made worthy by God to receive the gift of performing miracles. The faithful of the area came to him in order to be cured from various diseases, and to receive proper Christian teachings for their spiritual well-being. When the Saint reposed in the Lord, his body was buried in the place of his ascetic exercise, either by the faithful or maybe his disciples. 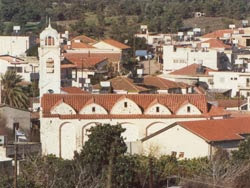 By a miracle of God, after many centuries, his holy relics where found in this way: According to narratives of the older residents of Lythrodontas, in past years, before the village was built where it is currently situated, there existed only a small settlement, situated at the site where the village cemetery is today. Once during night time, the people of this small settlement saw a light appearing where the church of the village is today built. They went searching the area but did not find anything. They saw again this mysterious light for a second and third time and the light finally appeared over a bush. That's when they decided to cut the bush at its root, and so they did. When the bush was removed, they discovered the tomb of Saint Therapon along with his holy relics. Right after this event they built a church in the name of Saint Therapon. This church existed until 1863, when it was demolished in order to build a larger church which exists up until today. A piece of the saint's forehead is preserved in this church until today, enclosed in a silver case and it's taken on a procession once a year on the Saint's feast day. Regarding the miraculous finding of the remains of Saint Therapon, the following is indicated in the Seventh Ode of his Divine Service: "Moses was previously shone by a pillar of light, a pillar which was shining from earth to heaven; a ray of light has shown you to us, where now your enduring and suffering body is situated and the devout and loyal faithful chant to you unto all the ages." After their discovery, the relics of Saint Therapon performed many miracles and healed many people, mostly those suffering from marsh fever. Up until today, the Saint performs different types of miracles to those who come with faith to his church. For this reason he was given the name "Wonderworker". Near the church there is also the holy water of the Saint. From the Doxastikon of the Saint's Divine Service, the Saint seems to have taught the following: "Love God, and ye shall find eternal blessing; choose His love because when He comes in His glory ye shall find rest together with all the saints." Also, a scroll on one of his newer icons reads: "Temperance of tongue and belly is the greatest philosophy." 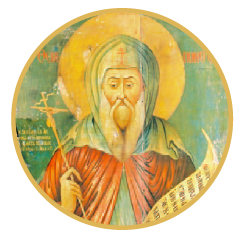 The memory of Saint Therapon of Lythrodontas is celebrated on October 30th. Source: Edited by John Sanidopoulos.